Sometimes I know exactly what I want to post for Rate the Dress, and that it is the perfect theme. Other times, like this week, I have no idea. What I finally settled on this week wasn’t my first choice, or my second, or even my third. Sometimes settling is a good thing, because if I hadn’t, I might not have looked at it up close, and found out that it was so much more interesting than I had thought. How so? Scroll down to find out! Well, Louise Carnegie picked well, both when it came to men, and to fashion, because her choice of wedding ensemble was very well received. A few of you didn’t care for the red-trimmed bodice variation (but then, some of you did), and not all of you were entirely sold on the colours. Interestingly, most of you saw the dress as sort of a khaki or light olive colour. Personally I thought it was a grey, with just the tiniest hint of brown. Well, it was a nice day for a non-white wedding! Fully two-thirds of the ratings were 10, and only two of them were under 9, so the total score should come as no surprise. I’ve looked at this ca. 1810 dress a number of times over the years, and thought that the elaborate coloured decorations, combined with the otherwise extreme simplicity of the dress, set it aside from the usual ‘white Regency frock’ category, and made it a good candidate for Rate the Dress. 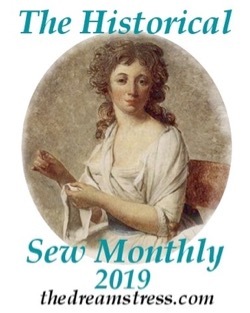 It wasn’t until I settled on it this week, and looked at the detail images that I realised the decorative motifs are not, as I’d always assumed, embroidery, but are instead beading. 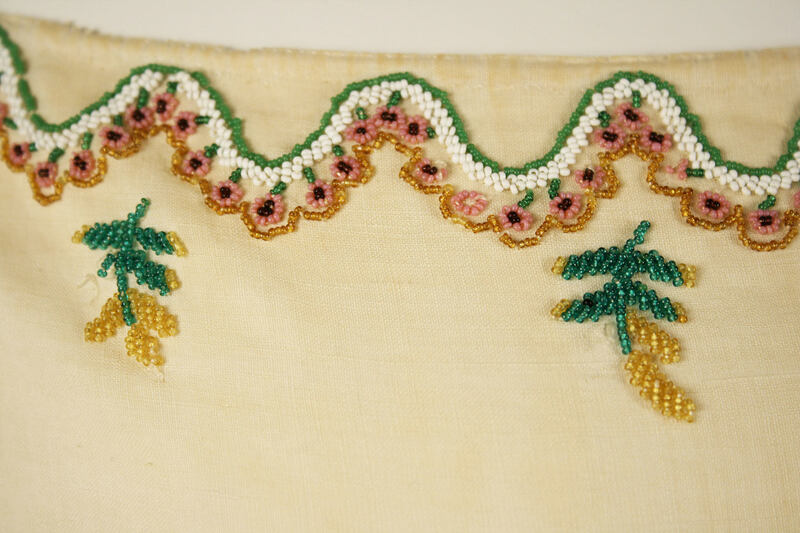 There are just a few touches of embroidery around the beads. The beadwork makes the dress so much more interesting (although not necessarily more attractive) in my mind. The beads would help weigh down the hem of the dress, so it would swing and swish around the wearer. They would also catch the light and sparkle in the evening, lending depth and dimensionality to the dress. Though largely intact, there are a few places where some beads have clearly come loose, making the design not quite as symmetrical and complete as it once was. 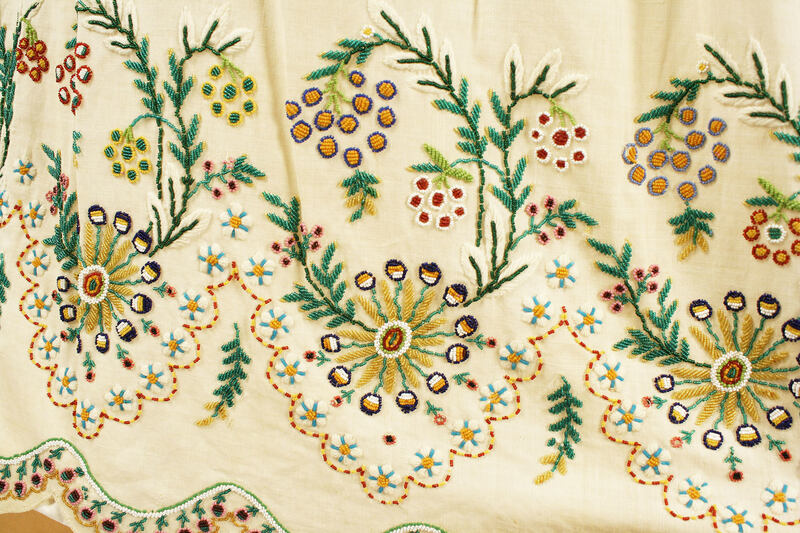 If the beading looks slightly similar to Native American beadwork in places, that’s probably because this exact type of bead was used as trading beads in the Americas. Other than the beading, this dress is extremely simple in cut, with a slightly darted bodice, and a back-opening that fastens with drawstring ties. 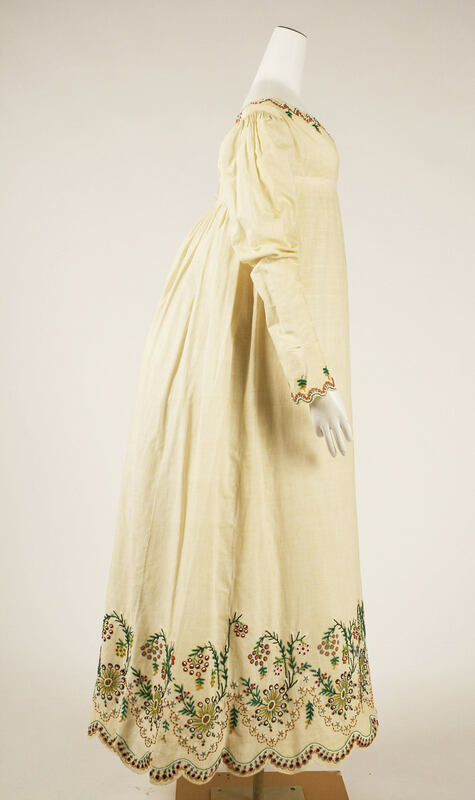 The too-long sleeves, by the way, are a typically 1810s feature. They were both intentional and fashionable. What do you think? Is it a beaded beauty? Or a combination of bland and bizarre? I love this amazing variation on the simplicity of that era’s fashion. The design of the beading looks like it would coordinate well with a shawl. Splendid summer gown! The simplicity of the fabric and cut make the beading stand out that much more. I can picture this dress on a woman strolling through a garden lush with flowers! This sure would be a bit more special than your plain muslin. I want a ribbon in green tied round the waist. But most probably it wouldn’t be the right green after all this time. I would like to see this on a person, because I didn’t realise how pouched out in back these gowns were. But maybe they styled it with something to hold it out at the back so all the beading could be seen. I admire the beadwork around the cuffs, neck, and hem of this dress, but the overall impression of the dress is very plain and informal, almost dowdy. 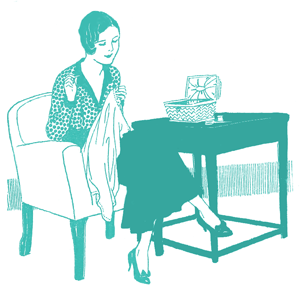 A sash at the high waistline, possibly in a green or yellow, might help. but then it might not. The fact that the green and yellow motifs around the neckline remind me of skinny pineapples doesn’t help at all. I like, but don’t love the dress. What’s holding me back is that the muslin looks so heavy and stiff. The ethereal muslin we sometimes see wouldn’t hold the weight of the beading, so I suppose it’s absolutely correct, but still. Love the beading. 10. Such beautiful work. I’d like to wear this dress!! I’d still have been impressed (I typed ’empressed’, but I don’t think I’ll take that line! :-D) if the work round the bottom had been embroidery, but I am delighted that it’s bead work! Just lovely, and you are right, it would hang and swish beautifully. The top is pleasing but a little bland – do you think there would have been a belt of some kind? I am splited, the cut of the dress is plain to boring. No really interesting details, only a bit fashion with the overlong sleeves. Hach, but the embroidery and the beads. So extravagant, I have never seen this on this type of dress before. Great craft skills to secure this work properly. Cute motifes. The beading is gorgeous, but it just reads as a nightgown to me. 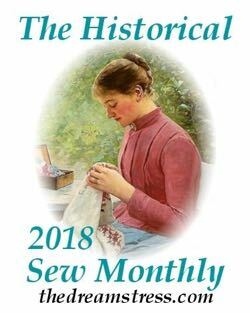 Another commenter said a green ribbon would be good around the waist, and I agree… It needs something to break up all that white between the collar and the Hem. 8/10, because even though it is nightgownish it remains pretty. 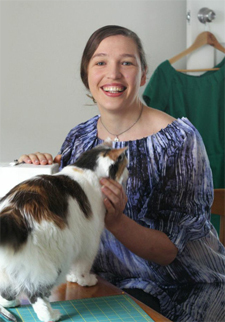 Koshka the cat did a beautiful replica of this dress! I agree with several others who said they would like to see a ribbon at the high waistline, that would help so much. A wow 10 …wonderful unique decoration BEAUTIFUL design maybe looks like flower possible st annes lace ? Or herb. the beadwork is fantastic, both the pattern and the colors, but I feel the lower part of the dress is too heavily decorated with respect to the upper part. Or the top is not decorated enough. It makes the overall impression imbalanced. Nightdressy came to mind with me too, but oh what a lot of work went into the beading. not sure I like the fabric but the pattern is so simple & lovely. Can only give it 8 though. From the front it reminds me of folkloric 1970’s clothing, but from the side she looks like a tropical giraffe dalek. Having the bust fullness so high and the rear fullness so low (and maybe the combination of the elongated neck terminating in utter lack of head and the creepy stiff doll-like ballerina hands) gives her a weird automaton look, like she would move forward by rolling instead of walking. I think the beading at the hem is quite impressive looking, although I’m not sure it’s terribly attractive. However, I find the beading on the bodice and the sleeves neither impressive nor attractive. I also dislike the cut of the bodice. I don’t like the fabric either. The heaviness and colour of it makes it look awfully like calico, although I suppose that could be discolouring through age. Love the beadwork and the fresh spring style; baffled by the seam that I would expect to be under the bust. Beautiful dress that I think would be called a “day dress”. 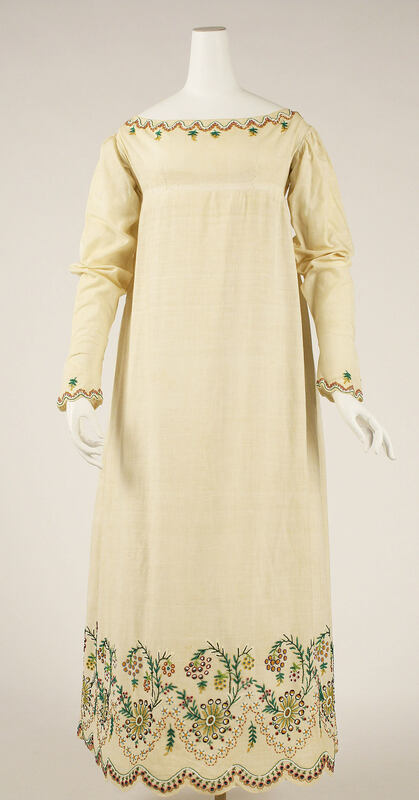 Almost the same as would be called a house dress in the early to mid 1900’s. Of course this garment was for a wealthier, non-working lady. I have seen similar, embroidered and beaded in a more skillful manner. 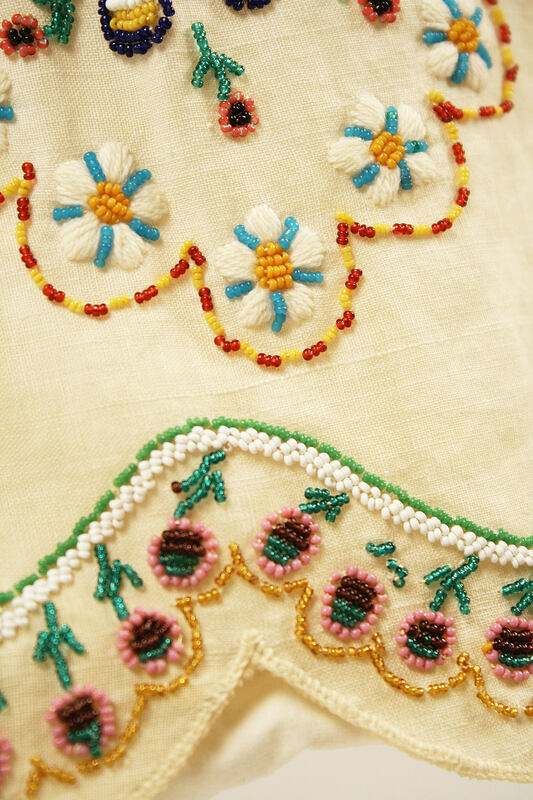 Nonetheless, the simple design of this cut with the almost primitive beading and embroidery make it very sweet and endearing.. Interesting addition, but I’m not sure I agree with the terminology. 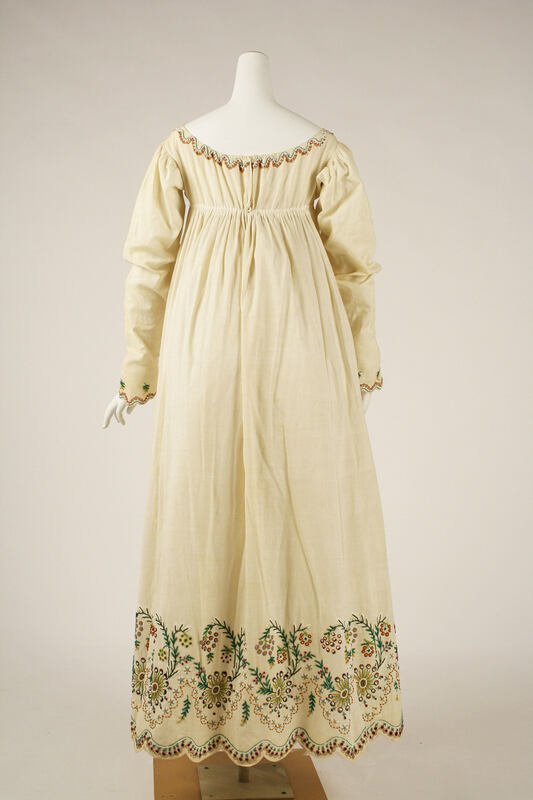 I’ve yet to find a ca 1810 fashion plate that uses the term ‘day dress’, though ‘morning dresses’ are common. The daywear/eveningwear distinction was really something that arose in the 1820s – before that it was really about informal or formal.